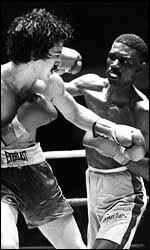 On this day in 1980, South Philadelphian Jeff Chandler won the North American Boxing Federation (NABF) bantamweight title by stopping Javier Flores in the 10th round at the Philadelphia Spectrum. Already the USBA titlist, Chandler ran his record to 20-0-1 (9 KOs) and continued to look like a future world champion to everyone who watched on. After three more fights (W12 Andres Hernandez, KO4 Gilberto Villacana, KO8 Gustavo Martinez), Chandler traveled to Miami to take on WBA champ Julian Solis. Of course Jeff would take that world title (by TKO in 14 rounds) and go on to defend it nine times. Chandler ended his Hall of Fame career in 1984 with a 33-2-2 (18 KO) record.